Home- "Let There Be Night"
A local response to a global issue. Students assess the quality of the night sky in their community and share their findings. More than 3,400 students observed Orion during multiple clear nights in March, recorded their estimate of sky glow, and entered their findings into the LTBN database. Wow! Thank you, families, for such a tremendous contribution to this community-wide science experiment. The Student Leadership Teams (SLTs) from each school then built a large model out of more than 35,000 LEGO® blocks to show visually how much of the night sky has been lost. The experiment results were presented at the May 11, 2009, PHM School Board meeting. WNDU TV news and the South Bend Tribune reported about the unveiling of the LEGO® model and the significant student effort. 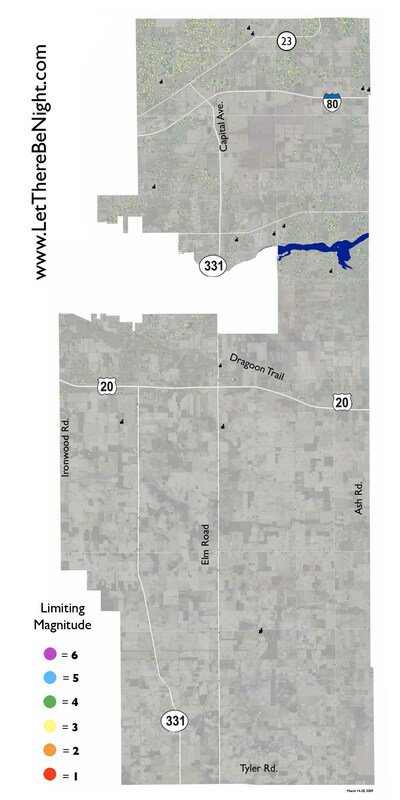 Left: Observations from 3,400 students are plotted onto a map of the school district. A stack of LEGO® blocks (from the bottom: red, orange, yellow, green, blue, black) suggests the level of sky glow at recorded sites. 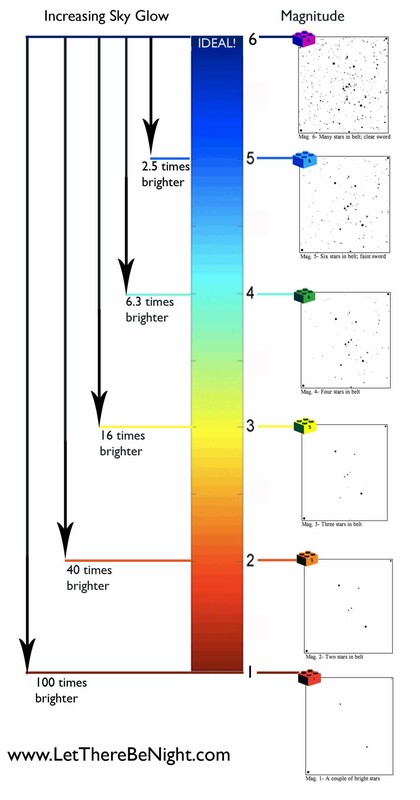 A perfect sky would be a full stack topped by a black LEGO® block; next best is a stack up to blue; a stack as high as green is showing a limiting magnitude of 4; and areas in yellow have more light pollution with an average limiting magnitude of 3. 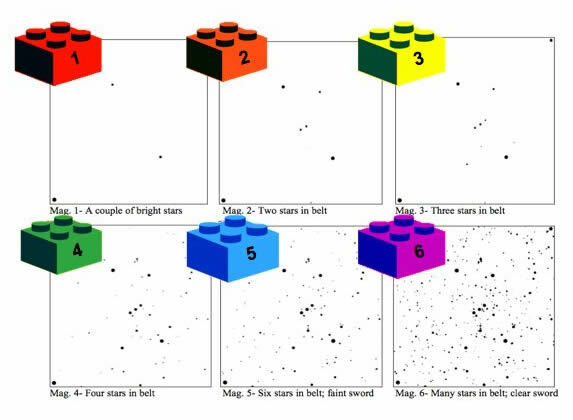 If you took away the LEGO® blocks from the ideal sky down (mag-6, or black LEGO® block) to the current observed sky, you would get the "debris pile" of lost night sky represented by the black, blue, green, and yellow LEGO® blocks in the foreground. 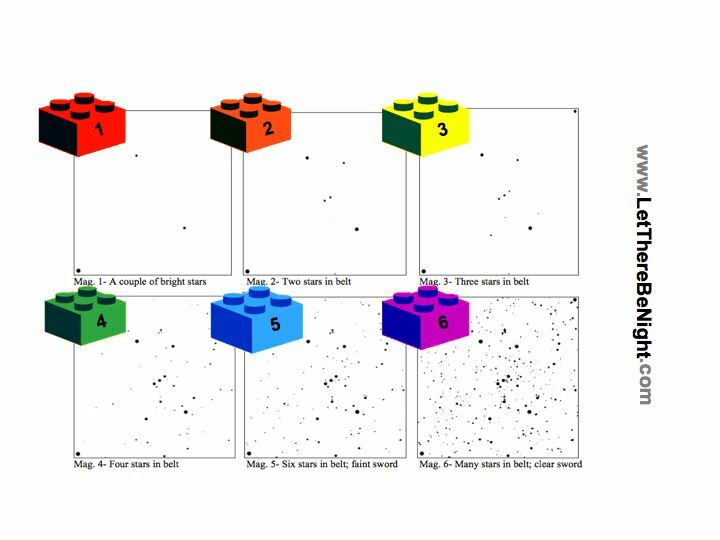 By The Numbers: From more than 35,000 stacked LEGO® blocks that would represent an ideal night sky across the PHM school district, over 12,000 LEGO® blocks were removed because they represent magnitudes of dark sky lost to light pollution. 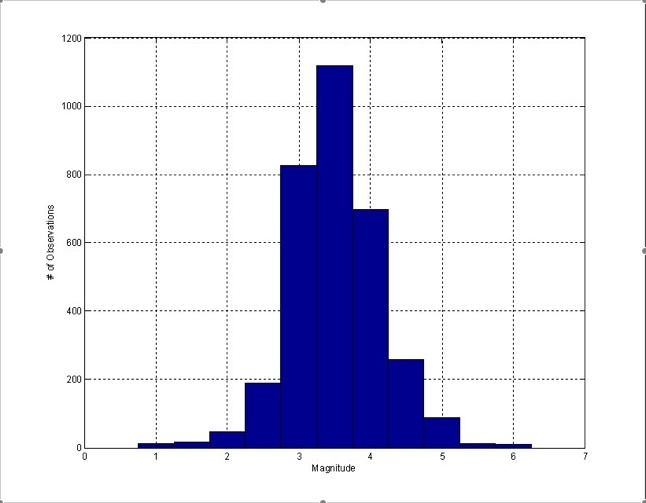 The histogram, left, suggests most of the remaining night sky levels are about mag=3 to mag=4.5. The increase in brightness from an ideal sky (assuming mag=6) to the current sky (mag=3.53) is about 9 times from the observed sites. 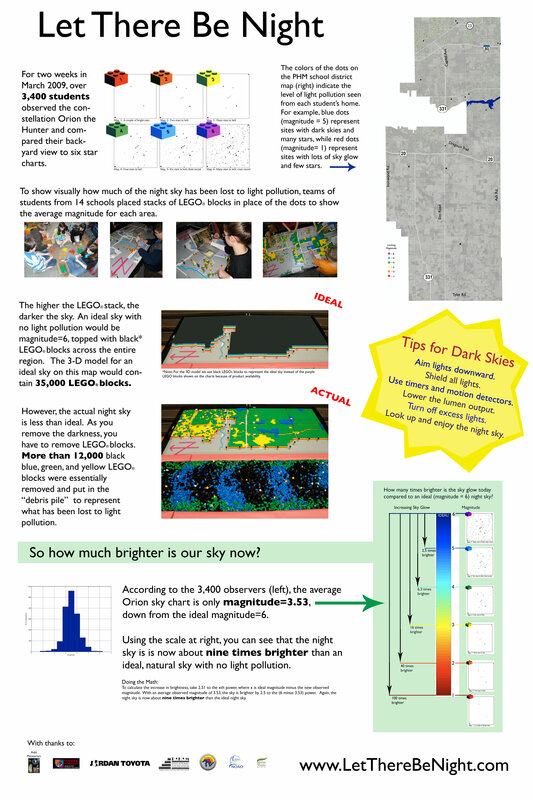 Bottom line: the student data suggests the local night sky today is nine times brighter than what an ideal night sky should look like if there were no light pollution. The 3D model of results made with LEGO® blocks will be exhibited at each PHM school for one week through January 2010, accompanied by a display poster (right). See /whatsnew.html for the exhibit schedule. To see what's been happening at individual PHM schools, see the interactive map at /phm.html. More LTBN news, events, satellite predictions, and website additions are at /whatsnew.html. Science Fair Project Ideas related to outdoor lighting issues are at projects.html and at ideas.htm. Now is the time to be thinking about your interests, fleshing out ideas, and maybe even starting the investigation. The grandeur of a night sky ablaze with stars has always been a part of our heritage. Today, nature's balance between day and night is at risk as errant and excessive outdoor lighting challenges our nightscape. While astronomers had initially raised concerns, we now know the value of the night extends well beyond the visual spectacle. Light pollution is an emerging environmental concern, for it affects the well-being of humans, animal habitats, and natural resources. It also costs significant amounts of energy and wasted taxpayer dollars. Hear the Podcast: Let There Be Night is featured twice on 365 Days of Astronomy, which is broadcast by the New Media Working Group of the International Year of Astronomy 2009. Hear the introductory podcast "Gosh Dim It All!" from January 18, 2009, and the concluding "Let There Be Night" podcast for August 17, 2009 at 365 Days of Astronomy. We encourage individuals and whole communities alike to embrace dark skies during the global IYA celebration. For example, everyone can compare their view of the constellation Orion to several star charts of Orion, then submit that observation to the GLOBE at Night campaign. The interactive Orion "slider" shows the stars that are visible at different levels of light pollution. The Penn-Harris-Madison (PHM) School Corporation in northern Indiana asks, "How much of the night sky have we already lost?" All students in grades 3-8 will quantify sky glow across the district through visual observations of Orion. A small group of students from each PHM school will also measure their local sky glow with hand-held Sky Quality Meters (SQMs). After all classes discuss and interpret the results, teams from each school will build a model out of LEGO® blocks to show viusually how much has been lost. Some students will then present recommendations to the school district’s energy education manager and to the PHM School Board. Among Let There Be Night objectives are to get families simply to look up; to introduce them to outdoor lighting issues; to generate a community dialogue on how we prioritize the tradeoffs of outdoor lighting technology; and to inspire better outdoor lighting practices. The Let There Be Night DVDs contains several resources that promote dark skies for the beginner and experienced advocate alike. Included is the planetarium program, a video introduction to outdoor lighting issues, a PowerPoint presentation, an audio recording, user-specific snippets, and educator resources. Let There Be Night will introduce students to outdoor lighting issues in conjunction with the 2009 International Year of Astronomy (IYA). At the planetarium, visitors will experience the starry night that likely inspired the story of Day & Night from the Pacific Northwest Nations. With a dynamic demonstration in the dome, visitors will also witness how three aspects of outdoor lighting--glare, sky glow, and light trespass--degrade the night. They will describe the trade-offs of outdoor lighting, and they will decide whether and how to act. The planetarium program segues to Orion and supports student participation in the Globe at Night star hunt. The night sky is a treasured part of our heritage that appeals to all ages. Let There Be Night seeks to reconnect people to a small piece of the sky so that they will be motivated to lessen their impact on the nighttime environment. During 2009, the world commemorates a simple act. Four centuries ago, Galileo turned his telescope upward and gazed deep into the firmament. While the act itself was simple, what Galileo did with his observations was a triumph. He recognized the profound implications of a few key observations. The 62nd General Assembly of the United Nations declared 2009 International Year of Astronomy (IYA2009). The year celebrates the human pursuit to understand the vast realm of space and the fantastic stuff that fills it. Dark Skies Awareness is one of the Global IYA2009 Cornerstone Projects. Concurrently, a theme of the US IYA program is "Dark Skies are a Universal Resource," a recognition that all people--not just astronomers--have much to gain from dark skies. On March 28, 2009, the final day of the Globe at Night campaign, people around the world turned off lights from 8:30 p.m. to 9:30 p.m. to raise awareness about our consumption of energy and earth's resources. Embracing Earth Hour in northern Indiana, the Let There Be Night (LTBN) Student Leadership Teams encouraged businesses, individuals, and governments to join us in flicking the switch. City of Mishawaka Mayor Jeffrey Rea proclaimed March 28, 2009, to be Let There Be Night, Earth Hour Day, right. See www.nightwise.org for ideas on how you can improve the quality of night, for dark matters. Copyright © 2010 Chuck Bueter. Design by Andreas Viklund.